Hey, froods - here's the hoopiest giveaway this side of those complimentary plates of Vogon nachos at the Restaurant at the End of the Universe. 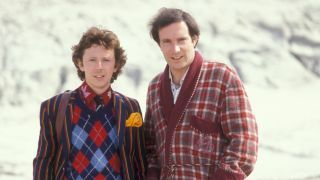 The classic BBC adaptation of The Hitchhiker's Guide to the Galaxy arrives on DVD and Blu-ray on October 1, 2018, remastered and upscaled and packed with a wealth of new bonus content. There's also a new 3-disc vinyl edition of the first radio series available. Five lucky winners will bag a copy of the Blu-ray along with the vinyl edition - and one of the vinyl editions up for grabs comes with a print of the cover art signed by Neil Gaiman, who's written the sleeve notes for this release.